We have loads more crafty DIY ideas over on our craft hub page so be sure to check those out too. This is the most simple knot going but you will need to know it if you want your macramé masterpiece to hang from a dowel or a ring (we have also seen branches being used for an even more organic vibe). See this as basically like the 'casting on' of macramé. Fold your rope in half and place the centre loop behind your hanger or pole. Take the two ends of the rope and pass through the centre loop. Pull the rope tight to complete the knot. The top image shows what the knot should look like from the front, the bottom image shows what it looks like from the back. 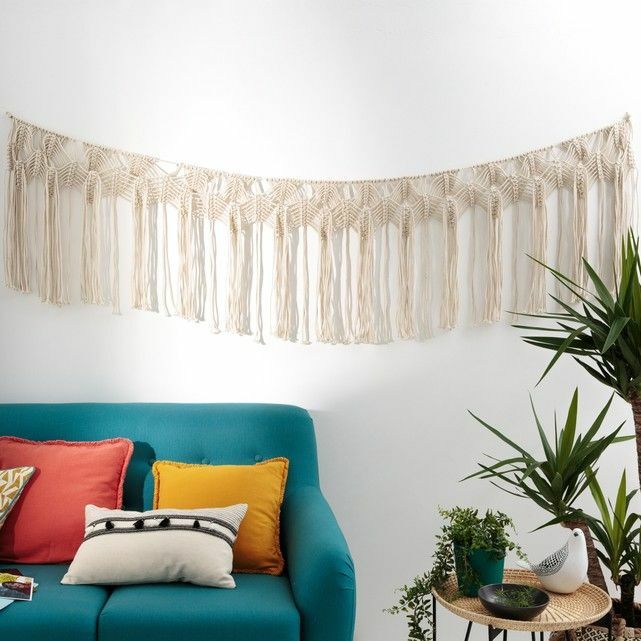 A square knot is what the bulk of most basic macramé wallhangings are made from, so once you master this one you can cover every wall in woven rope if you fancy. To make a square knot you require two pieces of rope, individually attached using a lark head heat knot. Take rope A over the two centre ropes and under rope B. Take rope B behind the two centre ropes and and through the loop created with rope A. Now take rope A over the two centre ropes and under rope B. Take rope B behind the two centre ropes and and through the loop created with rope A. Tighten the knot and that's your square knot complete. You can change up how many square knots you do on each row. So this is what you would get if you did two square knots on the first row, one on the second, and then back to two again on the third. A half knot is used if you want to create a sort of spiral effect, just see the below images for a better description. After 'casting on' with your lark's head knot, take rope A over the two centre ropes and under rope B. This knot is used if you want to create a sort of solid line of rope, again probably best you just revert to the pictures to see the effect. Lay rope A across rope B and the other ropes that are included in the pattern. Take rope B behind rope A and pull tight. Repeat step two again, taking rope B behind rope A and pulling tight. You have now completed the horizontal clove hitch with the first rope. Now keep repeating these steps with every other strand of rope that is in the pattern. Top tip: If you're working from right to left, just take cord A from the right-hand side and mirror the knots that you have just learnt. The diagonal clove hitch is exactly the same as the horizontal clove hitch, you just hold rope A at a diagonal angle and follow the instructions for the horizontal clove hitch.